All PostsHealth & FitnessHow ToProduct ReviewHome / All Posts / How to Eat Healthy at Fast Food Restaurants! It’s National Fast Food Day. I get it. American’s love to eat fast food. Its greasy, it’s easy, it’s cheap and it hits the spot. But its also EXTREMELY UNHEALTHY. 9 times out of 10 its loaded with unnecessary Calories, Fat, Carbs and Sodium. It’s no wonder that American’s are overweight (and complaining that they don’t know why). 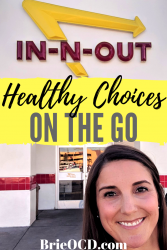 I am here to flip the script and tell you how to eat healthy when you are on the road or just need a quick bite before hitting that next meeting. Of course the “easy answer” is to be prepared and meal prep BUT if that is not an option, say you are traveling or just didn’t have time, you can still choose a healthier option. It’s 2018 and most fast food chains have at least one “healthier” item on the menu. go light on the sauces and dressings (fat free, lite, light etc). Most dressings & sauces “kill” the salad’s health. I took a poll on Facebook and asked everyone what their favorite fast food restaurant was. Not surprising there were a ton of responses but there were a handful of restaurants that were repeated over and over. I took that handful and scoured their website and menu and picked the healthiest thing on the menu in terms of calories, fat, carbs, protein & sodium content. Now you don’t have an excuse to not eat healthy when on the run! Chick-Fil-A has locations all around the United States (excluding VT, HI, AK) and Canada. Chick-Fil-A serves , you guessed it…. Chicken! Chicken is an amazing protein. Very versatile, low calorie, low carb, low fat and high protein. The issue here is the sodium content. I don’t know fast food restaurants do to their food but its definitely something to think about before rushing to eat it. 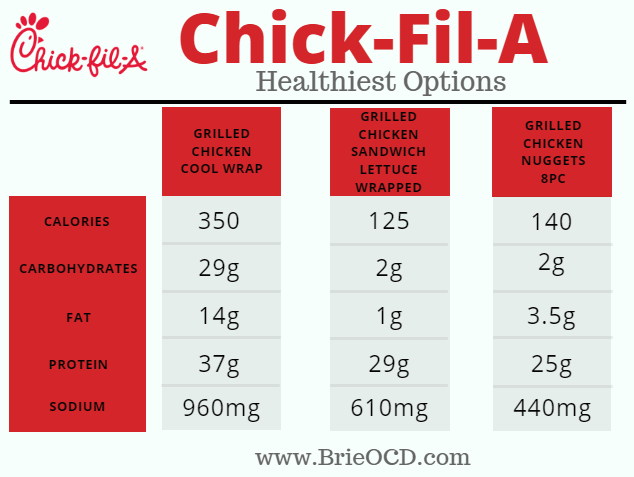 Click here for the full Chick-Fil-A Nutrition Chart. VEGETARIANS: Your best bet here is the Cool Wrap Sandwich without Chicken, The Superfood Side or the Market Salad Vegetarian. Yo Quiero Taco Bell! The chain has been around since 1962 and now has locations all over the US and Internationally as well. Growing up I thought that this is what Mexican food was. I would get a soft taco, a hard taco and a cinnamon twist fry. Boom! Now that I live in San Diego I haven’t eaten there in years (I mean why would you when you have authentic Mexican on every corner?) but apparently Taco Bell started in California (mind blown) and San Diegans still love it (I am sure you do too). Good news, is that Taco Bell came out with the Fresco menu in 2007 (really that long ago?!) and every item on this list has 350 calories or less and under 10g fat and the sodium levels (excluding burritos) are all under 500mg. Whohoo! 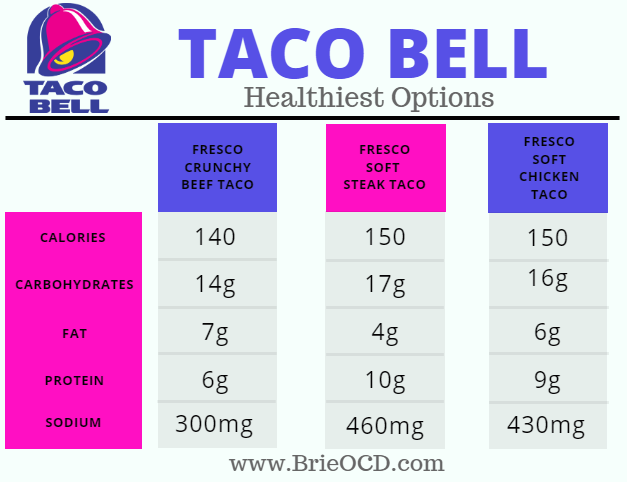 Click here for the full Taco Bell Nutrition Chart. FUN FACT: You can order any item on the menu “Fresco Style” and they will replace all the mayo based sauces, cheeses, sour cream and guacamole with fresh pico de gallo. Good ‘ol Mickey D’s. McDonald’s is an American Staple. You would be hard pressed to find someone that didn’t know what McDonald’s was. It started in IL in 1955 and now has locations all over the US and Internationally as well. I have frequented McDonald’s probably 5 times in the last 5 years and I have only ever gotten breakfast (we will usually go once a year on our road trip to Lake Havasu, AZ). Hello Egg White Delight! That being said, I am in the minority for sure because Mcdonalds is known for having served over 100 billion people. To eat healthy at McDonalds you just have to go Plain Jane style. No frills, no toppings, no buns baby! Surprisingly enough the salad has the highest sodium content all of three options below, topping the charts at 1280mg. 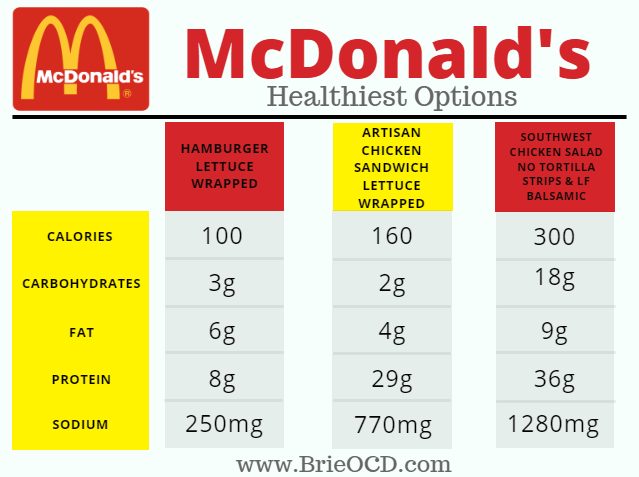 Click here for McDonald’s Nutrition Calculator. VEGETARIANS: Unless you want to survive on fries alone or some plain leaves of lettuce. I suggest getting the Southwest Chicken Salad without the chicken and with Low Fat Balsamic Dressing. Popeyes first opened in 1972 in Louisiana and is known for their fried chicken! However they should also be known for their high sodium content because it is off the charts! The only time I have ever been to Popeyes was actually doing research for this blog. There weren’t a lot of locations in RI growing up and there aren’t a lot in San Diego. That combined with the fact that I’m not a big fried chicken girl. Well….you get what I’m putting down. It was slim pickins’ on the nutritional side of things at Popeyes but below is the best I could find! (sodium is under 790mg for all three options). Surprisingly enough, when I went there none of the “healthier” items that are listed below were on their menu BUT they did carry them. Is “health” a secret there? 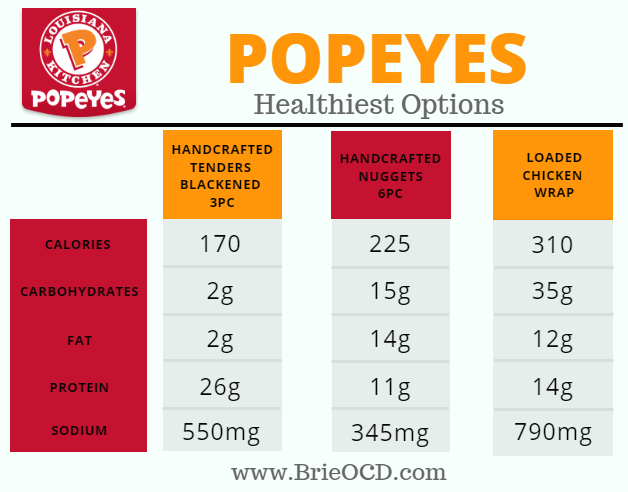 Click here for the full Popeyes Nutrition Chart. VEGETARIANS: Good Luck! Just kidding but not really. You can request the loaded chicken wrap without the chicken or just forget health and order mac n cheese or corn on the cobb. Don’t even think about ordering the mashed potatoes and gravy because it is made with chicken gizzards. Yum! Chipotle! I do have to say that this is one of my go-to fast food establishments. I don’t eat fast food out often but if I am traveling or on the road and need something in my belly this is a good contender. At the risk of sounding like a broken record the sodium content at Chipotle is OFF THE CHARTS. Some of the meats alone have over 500mg and then you add the pico de gallo and you are already over 1,000mg. This to me is SHOCKING, as I tend to think of Chipotle as healthy fast food. If you are not concerned with your sodium intake then Chipotle is the place for you! They do have some the healthiest options around (excluding sodium) and its easy to be a vegetarian here because you can customize everything! 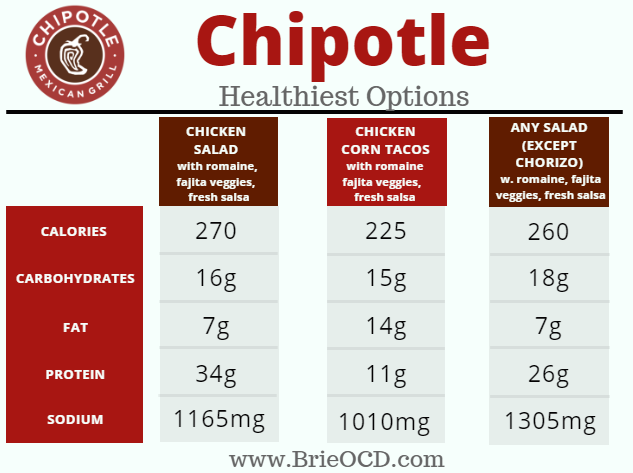 Click here for Chipotle’s Nutrition Calculator. VEGETARIANS: Get the Sofritas salad with no vinaigrette! Load it up with fajita veggies, salsa and a little dollop of guacamole and you are in business! Click here for my healthy version recipe of Chipotle’s Barbacoa Bowl! I have to say that I wan’t overly impressed when I went to Habit Burger BUT I think I may need to give it another shot as so many people are overly enthusiastic about it (ahem mullet)! Habit Burger started in CA in 1969 and is now located in 11 US states and China (random) with more expansion plans rolling out in the US. They are known for their burgers but I have also heard great things about their salads (I’ll be the judge of that!). The best thing about Habit Burger is that the sodium content isn’t off the charts. I am not saying its phenomenal BUT you can find at least 1-2 items in each section with under 1,000mg (which still isn’t something to brag about). 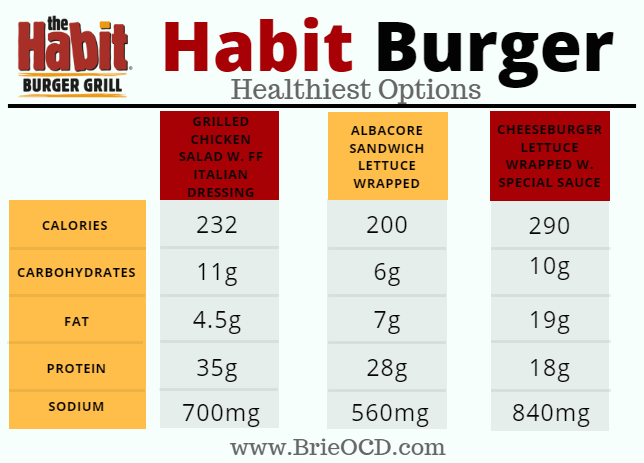 Click here for the full Habit Burger Nutritional Chart. VEGETARIANS: You are in luck! They have a veggie burger on the menu! The veggie burger lettuce wrapped clocks in at 230 calories, 9g fat, 16g carbs and 20g protein. Not too shabby for a vegetarian meal! In-N-Out, my love. I can’t believe I ever said I didn’t love you. I am sorry! I will make it up to you for the rest of my life! In-N-Out is basically the only fast food I ever crave and eat a couple times a month. I am obsessed. In-N-Out first opened it’s doors in CA in 1948. It is known for its fresh burgers and fries and is only located in 6 US states (CA, AZ, NV, UT, TX OR). Everything is fresh and never frozen and their fries are straight up potatoes sliced (I do add salt though, whoops). It is cheap (Five Guys can kiss my behind) and delicious! 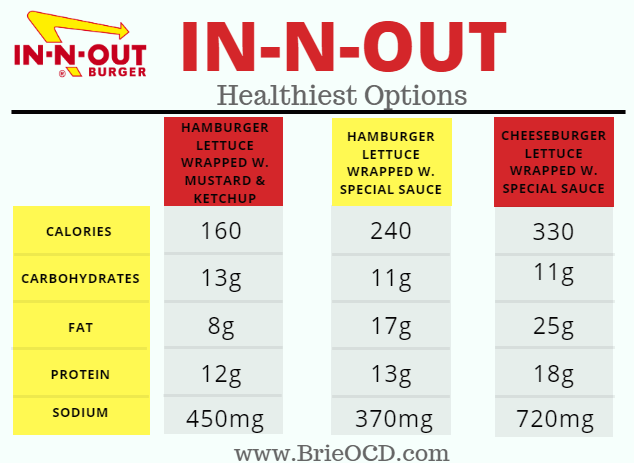 I am not saying In-N-Out is healthy I am just saying if and when I do eat fast food, this. is. it. I don’t eat this for convenience, I eat this because I straight up want a double double cheeseburger with grilled onions and nothing and no one is going to stop me! VEGETARIANS: In-N-Out doesn’t technically have anything specifically for non-meat eaters (their menu is simple) but you can order a grilled cheese or a veggie burger (which isn’t really a veggie patty, it’s just the bun with all the toppings and no meat). PLEASE NOTE: You can sub out the special sauce with mustard and ketchup on any burger. The calories decrease by 80, fat content decreases by 9g and protein by 1g BUT the sodium content increases by 80mg and the carb content goes up 2g. Pick your poison. PLEASE PLEASE NOTE: If you see an In-N-Out and you are not watching your figure and you have one shot to get it right, just order the double double with grilled onions (lettuce wrapped or with a bun). You will not regret it! Others will say to also get the fries animal style but I personally just go regular ‘ol fry! This is not a pass to eat fast food everyday. Not even close. I say these are healthy options but that still doesn’t give them an A+. Making homemade meals where you know exactly what you are putting into them is the A+ answer. Its the only way that you truly control what you are ingesting (you are what you eat!). So tool around my website and get some A+ recipes to make at home and take with you on the go! I’m working on losing weight, but for New Years, my family wants to eat out. It was so helpful when you mentioned that I should ask for sauces on the side, as it will give me control over how much I eat. Thanks for all the great tips on how to eat out healthily.